Please note that the references contained herein or links to those references may be found on a single page within www.geosynthetica.net. Geosynthetica.net is a free technical information resource regarding all manner of geosynthetics. Click on the Land and Water logo/“Agricultural Challenges Tech-Composite” on the front page of geosynthetica.net to review the resources identified in this article by this symbol Δ. Diagram of potential containment concerns with geosynthetic solutions in agricultural facilities. GEOSYNTHETICS, as you may be aware, are synthetic materials used in a wide variety of applications to create barriers, control erosion, and provide containment, filtration, separation and drainage. Although these materials are all categorized as geosynthetics, their applications and properties are unbelievably varied. Users and manufacturers are constantly developing new and enhanced materials and applications. Some of the types of geosynthetics with which you may be familiar include geomembranes, geotextiles, geogrids, geofoam, geosynthetic clay liners (GCLs), geonets, geocells and geocomposites which are typically formed from a combination of the previously mentioned materials. Each and every one of these materials has the potential to be well utilized and beneficial in various agricultural applications. Waste generated by livestock and processing can generate some serious concerns for Agricultural Facilities Operators. The Environmental Protection Agency (EPA), National Resources Conservation Services (NRCS), and United States Department of Agriculture (USDA) all regulate various parts of these operations; fines and restrictions can be levied and litigation can follow improper management of these wastes. It is critical to the function, longevity and profitability of any operation generating waste that the surplus be managed within the parameters set forth. It is also vital for this management to be cost effective. There are two major areas of interest when managing these wastes: containment and odor control. It is required that wastes be contained in such a way that the groundwater not be contaminated. The NRCS mandates that lagoons must be lined to control waste seepage. There are two accepted methods: compacted earth lining systems and geosynthetic lining systems. Earth basin for manure storage. 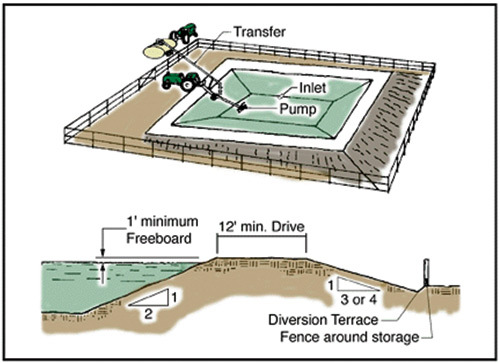 Source: Livestock Waste Facilities Handbook, MWPS-18, Midwest Plan Service, Ames, Iowa. It is difficult to say with absolute certainty how successful compacted earth lining systems will be. There are a number of factors which impact these systems. The type of soil used, sub-grade, moisture content and climate must all be considered. Additionally because this system is effectively manufactured/ installed with a wide range of variables from one foot of land to the next there is no guaranteed consistency of the system. While we can not specify a generic formula regarding the success of compacted earth systems, we do know much about the success and durability of geosynthetic lining systems. Properly designed and installed systems generally have an exceptionally low permeability rate and (contingent upon the material selected) a lifetime of up to 449 years.1 Stringent manufacturing and quality control testing ensure that the product is consistent and (when properly installed) extraordinarily effective, which has been proven in a number of studies. In the paper A Forensic Study of an HDPE Liner After 10 years of Exposure by Matthew W. Adams and Nicole Wagner of GSE Lining Technologies Δ, it is proven that an HDPE liner, used in waste containment, retains more than enough of its properties to effectively function as a barrier. There are a number of materials available to an Agricultural Facilities Operator for the lining of their waste storage facilities. The NRCS Conservation Practice Standard 521A titled, Pond Sealing or Lining  Flexible Membrane (ftp://ftp-fc.sc.egov.usda.gov/NHQ/practice-standards/standards/521a.pdf Δ) identifies the acceptable minimums for five different geomembrane material types including: HDPE (High Density Polyethylene), LLDPE (Linear Low Density Polyethylene), PVC (Polyvinylchloride), EPDM (Ethylene Propylene Diene Terpolymer ) and GCL (Geosynthetic Clay Liner). Each of these materials has slightly different properties, costs and benefits. √ Filter criteria for embankment soils. Additionally, consideration for containment size, wind conditions (exposed vs. covered liners), precipitation (overflow and drainage) and facility growth should be given when designing a waste containment system. It is clear from the number and type of considerations that a designer with experience in waste containment systems should be consulted during development. The bottom line on the lining system? It must work to protect the environment, ground water and surface water. It must work to protect the business  failure of the system could result in fines and ultimately closure of that business. To succeed, the system must be appropriately engineered and properly implemented. Additional guidance for this process can be obtained by reading the NRCS specifications for Waste Treatment Lagoons (ftp://ftp-fc.sc.egov.usda.gov /NHQ/practice-standards/standards/ 359.pdf Δ). Specifications and information regarding the installation of lining systems can be garnered from a number of different places including: the International Association of Geosynthetics Installers (IAGI) Δ, geosynthetica.net, ASTM Δ. Often times, once a waste containment system has been designed and filled, covering is the next significant hurdle. Associated with everything from regulated Volatile Organic Compounds (VOCs) to complaints from the neighbors, the gasses generated by waste containment systems are a problem which must be addressed. Geosynthetics can provide a variety of solutions for this problem. Covers for solid waste and floating covers for liquid waste are, just as they sound, covers which diminish the gas entering the atmosphere. These covers contain the gas which then needs to be vented, discharged and flared off in a controlled manner. There have recently been some interesting developments in this arena, specifically, the use of a composite floating cover who’s top surface can be covered with a mineral product which causes the cationic disassociation of the emitted gasses. By effectively disassembling the ammonia, this floating cover system changes a harmful noxious gas into a passive gas as it filters through the cover. It is reported that the reduction in gasses reaches between 80 and 90%. Created by Huesker Inc. Δ, this system branded Zeomat® reduces both the odor and the environmental impact of waste generated gasses. Although more complex than the simple floating cover, these systems can, in the right circumstances, generate enough benefit to warrant their management. Geosynthetics play the role of containment for the system both as a bottom liner and cover system, as well as the collection system. The NRCS Δ has funding available for all of the systems discussed in this article  up to 75% of the over-all cost may be covered by EQUIP (Environmental Quality Incentives Program). Irrigation  Water or Gold? Drought, conservation, growing populations, water rights, water law … the list goes on  there are so many issues impacting the cost and availability of water to the agricultural industry that we have reached a point where effective water management is vital to agricultural industry survival. With our water supply getting smaller and being stretched further the emphasis must be placed on loss control and effective use. Loss of water due to seepage in unlined irrigation canals has been reported at as high as 50%. The Canal Lining Demonstration Project 10 Year Final Report published by The Bureau of Reclamation identifies that by lining canals, the loss (contingent on the system used) can be decreased by between 70 and 95%. The Bureau researched and studied a series of “34 canal lining projects in 11 irrigation districts in four States to assess durability and effectiveness (seepage reduction) over severe rocky subgrades.”3 The projects used a variety of lining systems including: combinations of geosynthetics, shotcrete, roller compacted concrete, grout mattresses, soil, elastomeric coatings, and sprayed-in-place foam. The size of each test segment ranged from 15,000 to 30,000 square feet. Each of the sites was evaluated both on cost and lining effectiveness and as a result, preliminary benefit cost ratios have been developed. Although the geosynthetics community believes some of the estimates to be conservative, the report emphatically makes the argument for geosynthetics in canal lining specifically for water conservation. This report broke the results down into four generic categories: exposed geomembranes, fluid-applied membranes, geomembranes with concrete cover, and concrete alone. In table ES-1 on Test results for the 34 test sections of the reports’ Executive Summary the USACE establishes rates of effectiveness and a cost benefit ratio for each method of lining used Δ. “Each of the lining alternatives offers advantages and disadvantages. The geomembrane with concrete cover seems to offer the best long-term performance. Fluid-applied membrane  Many of these test sections have failed and have been removed from the study. Most of the problems were related to poor quality control because of adverse weather common to field construction in late fall and early spring. These types of linings may have potential for special niche applications such as lining existing steel flumes or existing concrete channels. Concrete  Excellent durability, but long-term effectiveness was only 70 percent because of random cracking. Irrigation districts are familiar with concrete, and they can easily perform required maintenance. Exposed Geomembrane  The effectiveness is excellent (90 percent), but exposed geomembranes are susceptible to mechanical damage from animal traffic, construction equipment, and vandalism. Although exposed geomembranes have the lowest initial construction costs, they have a limited service life (typically 15 to 20 years). Also, exposed geomembranes are often poorly maintained because irrigation districts are unfamiliar with the geomembrane material, and sometimes need special equipment and training to perform even minor repairs. 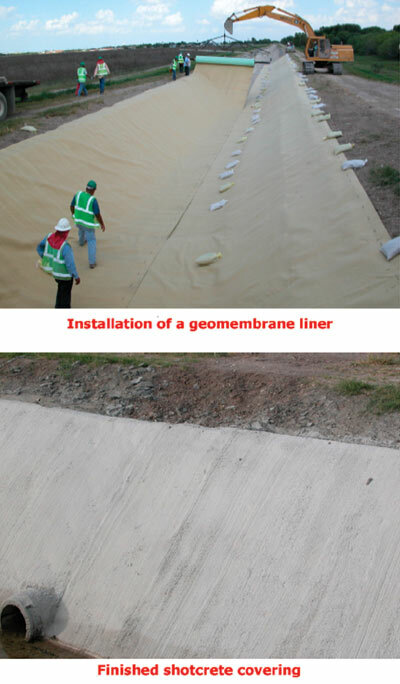 Concrete with Geomembrane Underliner  The geomembrane underliner provides the water barrier, and the concrete cover protects the geomembrane from mechanical damage and weathering. System effectiveness is estimated at 95 percent. Districts can readily maintain the concrete cover, but they do not have to maintain the geomembrane underliner. Effectiveness  Ponding tests showed a typical preconstruction seepage rate of about 1.0 foot per day. Post-construction ponding tests showed effectiveness of 70 to 95 percent for the various lining alternatives. Maintenance  Over the course of 10 years, maintenance costs have been relatively low for all the lining alternatives. Generally, exposed geomembranes require about twice the maintenance of concrete linings. For all lining alternatives, benefit/cost analysis shows that every $1 spent on maintenance returns $10 in conserved water by increasing effectiveness and design life. Therefore, more emphasis should be placed on maintenance, especially for exposed geomembrane linings.”3 Δ. There are a number of research groups and manufacturers Δ actively participating in water conservation and irrigation systems control research. A wide variety of environmental variables including substrate, climate, irrigation system size, maintenance resources and anticipated life span should be analyzed to develop the best solution for each individual system. Geosynthetically-enhanced irrigation systems have the ability to stop up to 95% of the water loss  they can pay for themselves 10 fold even with maintenance costs. These systems or system enhancements are most often eligible for funding support (up to 75%) from the NRCS’s EQIP making them not only cost effective, but quite possibly profitable. Above: NAG S150 blanket used in grass waterway. Below: Same blanket with vegetation beginning to establish. “Strict local, state and U.S. federal water quality legislation has made engineers, architects, contractors and land owners more aware of their responsibilities to employ effective and economical erosion and sediment control practices. The recent implementation of the NPDES Phase II has made this need even more acute. The EPA reports that in fiscal year 2003 $2.9 billion in fines and injunctive relief was assessed. These funds will go toward clean up of polluted sites and protection against further environmental harm. On most construction sites, erosion control (the process of restraining the initial movement of soil particles by wind and water) is the most proactive and cost-effective way of complying with regulations. 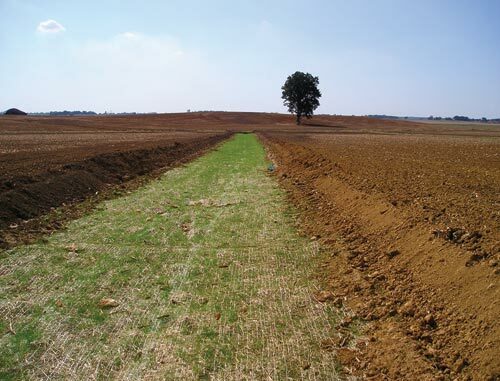 Exhaustive laboratory and full-scale field research has verified that “balanced” protection of the soil surface using permanent vegetation is an efficient and aesthetically pleasing form of erosion control. This realization has created an industry dedicated to manufacturing rolled erosion control products (RECPs) designed to help mitigate immediate erosion-control problems and provide long-term soil stabilization through the establishment and maintenance of vegetative cover.”4 Δ. The environmental and potential economic impact of erosion control, or lack there of, is weighty. Erosion control helps to maintain water and land resources. Lack of erosion control can cause irreparable damage to the environment and the lifeline of many agricultural businesses. Additionally several NPDES mandates and associated fines make it imperative, from a business perspective, that erosion control issues be taken very seriously . There are a number of valuable recourses to aid in the evaluation of erosion control requirements and solutions. RECPs are “manufactured from wood excelsior, straw, jute, coir, polyolefins, PVC and nylon. This growing family of materials enables designers to incorporate the superiority of long-fibered mulches with the tensile strength of dimensionally stable nets, meshes and geotextiles.” These materials match nature with science to offer the most thorough and cost effective set of solutions available to date. As with the other applications mentioned in this article there are a number of engineering criteria which should be reviewed in order to select the proper material type and design. Slope, terrain, climate, term requirements and other conditions should be analyzed by an expert to develop this solution. ECTC has developed a set of specifications which are commonly used by State Departments of Transportation and regulators to establish the best design solutions using the various established categories of erosion control products. It is a valuable resource for finding the right solution to your erosion control problem. 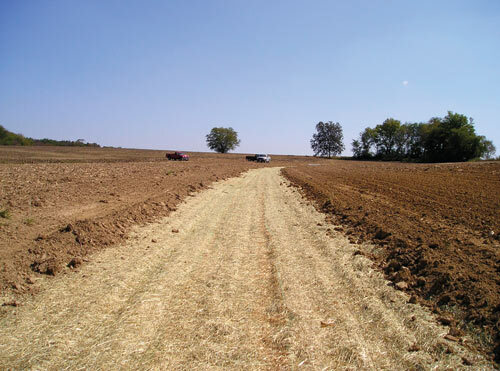 As with the previously mentioned geosynthetics applications the NRCS will provide financial assistance of up to 75% for the development and implementation of erosion control plans in agricultural applications. This may well be an instance where the proper use of government money could prevent liability (in the form of fines) to different government entities. There is an enormous amount of financial support available through the NRCS for development and implementation of these systems. The overall cost to the landowner can be as low as 25% of the gross cost. Geosynthetics have been proven effective and can supply agricultural business with a more profitable and improved operation while simultaneously reducing environmental liability. Geosynthetics are engineered solutions, so to work effectively the conditions surrounding their use must be properly evaluated and the right solution designed and installed. They are not complicated but must, like most things, be done properly to work properly. In some instances maintenance will be required. Even so, geosynthetics have proven to be cost effective. A ten fold return on the maintenance dollar in irrigation applications has been identified by the Bureau of Reclamation. More and more environmental regulations are being developed and enforced. Compliance is mandatory and the cost of non-compliance can be devastating to any agricultural business. Thank you to all of the contributors to this article: Dohn Berger  Intertape Polymer, Boyd Ramsey  GSE, Ronald Frobel  R.K. Frobel & Associates, Laurie Honnigford  The Honnigford Group, Christopher Kelsey  GFR Magazine. ©2005 - 1998 Land and Water, Inc.